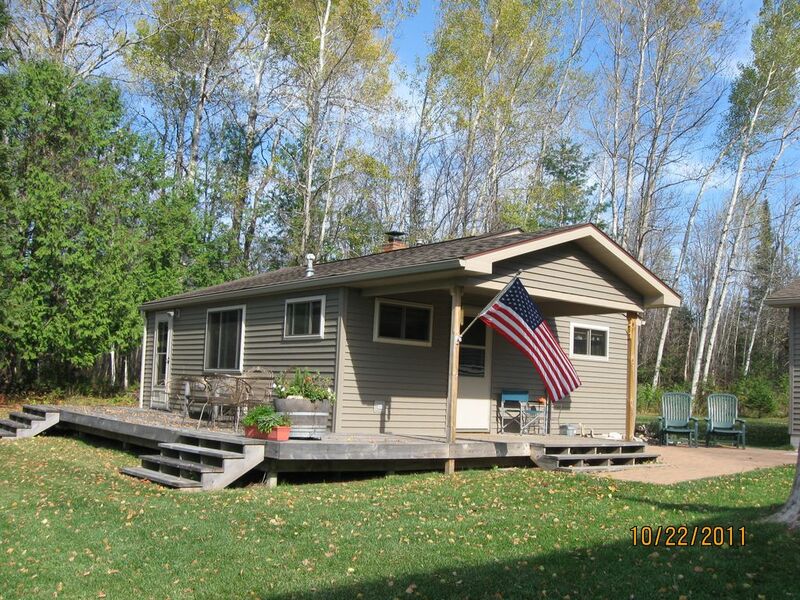 Silver Rock is a fully equipped vacation rental that offers a true 'Up North' Michigan feel. It offers 272 ft of private lake frontage with a 14 ft boat, a canoe, a paddleboat, and dock included for your use. A firepit (wood provided at no cost) is also included. Directv is always a touch away for those rainy days. You can Fish, Hunt, Hike, Bike, ORV, Canoe, Kayak, Golf, Casino, Birdwatch or just relax. There are thousands of acres of state owned land nearby that are also available for your use. “A sportsmen’s paradise”! Silver Rock is available the last Saturday in April through the last day in October. Fishing season opens the last Saturday in April. Ocqueoc Lake is a no wake lake! My wife and I have been sharing our 'slice of heaven' for 35 years. Unlike many lake properties where the cabins are close to one another, Silver Rock will give you the feel of the only cottage on the entire lake. Another cottage cannot be seen from our shore. One visit to Silver Rock will give you that true 'up north' feeling. Lake Huron is approx. 3 miles away and there are smaller Trout streams in any direction. The American Indians referred to this area as 'Sacred Land'. It is the ideal location for outdoor lovers and sportsman. Although the owner lives next door, privacy is respected. Great quiet long weekend stay. The owners were wonderful!!!!! Went for a long weekend. Great quiet stay on ocqueoc lake. Owners were great had lots of information about places to visit in the area. Had fun fishing around the lake and enjoyed watching the birds. Will definately be back for a longer stay and will be more determined to catch those fish. Great place to hang. Hosts are superb people. To enjoy the secluded place by ocqeoc lake. Great stay. We had a wonderful time! A great place for a quiet getaway! Would love to go back! We loved our stay! The owners were wonderful. We had fun fishing and relaxing as a family. We enjoyed exploring the area including the waterfalls, Rogers City, 40 Mile Lighthouse, and much more. Would love to stay again! We enjoyed our stay. Very nice cottage. And very clean. Fishing was fun beautiful setting. And very nice people to rent from. A Truly Peaceful and Enjoyable Stay! Clean & Comfortable Cottage! Wonderful Hosts! We had a wonderful stay at the Silver Rock Cottage. Enjoyed the tranquility of the spot on Lake Ocqueoc...Eagles across the lake in the mornings and so quiet you can even hear the wings of the hummingbirds at the feeder. Steve and Vickie were wonderful hosts - available for questions and to help guide and give suggestions from where to fish on the lake to sights not to miss in the area. The cottage was very clean and comfortable and provided all the amenities you may need. We were looking for a quiet and secluded place and found it here. We also enjoyed Rogers City, the lighthouses at 40 Mile Point and Presque Isle. Thanks Steve and Vickie for making our time in your area so enjoyable. Thank you Shelley for the nice review! Was looking for a quiet weekend and found a charming retreat. Owners were supper nice and had great ideas for things to do if you wanted to explore northern Michigan. I will defiantly be going back. Although our cottage is a very secluded setting, there are many activities within a 1 hour drive. Ocqueoc Falls are 7 miles away and are lower Michigan's only falls. Gaylord is a golf mecca. Petosky has many shops as well as a Casino. Mackinaw Island is famous for its shops as well as it's historical importance. Miles of hiking, biking, ORV trails nearby. Rates are based on double occupancy. Open last Saturday in April through last day in October. Check-In Time- 3:00 pm, Check-Out Time- 11:00 am No short stay surcharges or cleaning fees.